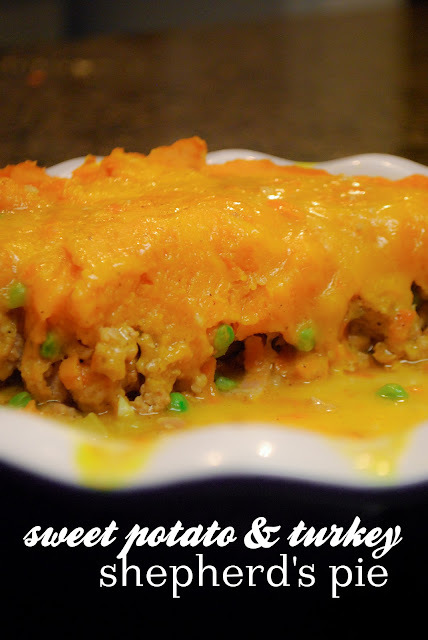 Comfort food, really delicious and full of autumn flavor. I made this for dinner last night and it was very satisfying (an added bonus was using only ingredients I already had in my kitchen). I had turkey, sweet potatoes, peas and mirepoix ingredients so I looked at a few recipes for shepherd's pie using those ingredients and then made my own. I love when things that you just throw together turn out wonderfully. Preheat oven to 425. Cover sweet potatoes with water in a medium pot and add a bit of salt. Bring to a boil and cook until potatoes are fork-tender. When cooked, drain and return to pot. Mash lightly with a potato masher and stir in about 1/4 cup of the gravy (see below). Salt and pepper to taste. While potatoes are cooking, in a large saute pan, brown bacon until almost crispy. Add carrots, celery, onion and garlic and saute until barely tender. Add seasoning and salt and pepper to taste. Add turkey to the mixture and brown until cooked through. In a small saucepan, melt butter over medium heat. Whisk in flour and cook about 1 minute until the flour smell is gone. Pour in the chicken stock and the Worcestershire sauce and whisk occassionally for a few minutes until thickened. Salt and pepper to taste. Pour the gravy mixture into the vegetable/turkey mixture along with the peas (I didn't want to use all the gravy so I ended up only using about half of it) and remove from heat. Pour into a casserole dish (I used a large round pie pan but it was pretty full) and spread the top with the sweet potatoes. Sprinkle the shredded cheddar cheese on top and set on a cookie sheet, to catch any drippings. Set in the oven and cook for about 8 minutes until heated through and the cheese is melted. You can also turn on the broiler for the last few minutes to get a bit of a crust on top (which we like). Last night I knew I would be husbandless for the evening, so I went to the store and picked up a large piece of wild salmon and used your panko crusted salmon recipe...it was SO good. Thanks for posting it! WHOA! I made this last week and LOVED it! Funny thing was, I was going to post about it too! My husband loved it took which is a miracle because he usually is if-fy about trying new healthier alternatives to the norm. Hahaa! Great minds, girl, great minds! Weird weird weird! I just made a turkey shepard's pie with classic turkey stuffing spices and spiced cranberry apple dressing tonight for dinner and for a friend that just had a baby. I couldn't find a recipe that I liked so I just took ideas from some cookbooks and made up my own. It turned out very yummy - like Thanksgiving casserole. Yours looks amazing! I love the sweet potato idea!